Hyundai Ioniq is a petrol-electric hybrid that’s coming to Australia later this year. 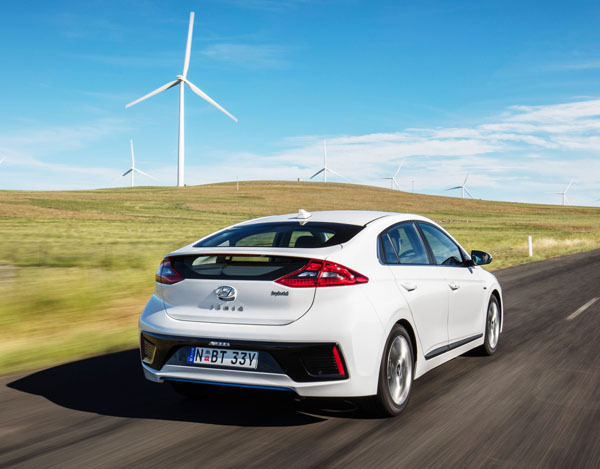 Prior to sale, Ioniq hybrids are being driven in series of fleet tests, with the Australian Red Cross being the biggest testing organisation at this stage. We were invited to test a Hyundai Ioniq for a week, however we are not part of the official testing regime. My colleague Derek Ogden published his road test of the Hyundai Ioniq last week. Mine is a supplementary test with its major focus being on fuel consumption. See the Driving section of this report for details. 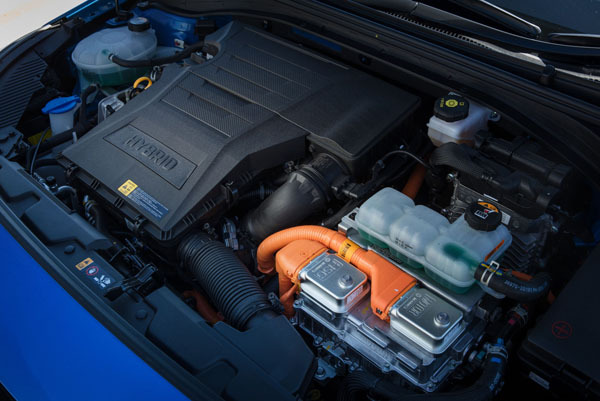 Hyundai Ioniq hybrid has a 1.6-litre petrol engine and a permanent-magnet synchronous electric motor, the motor gets its ‘fuel’ from a 1.56 kWh lithium-ion polymer battery. The dual power sources are mated with a six-speed dual clutch automatic transmission. 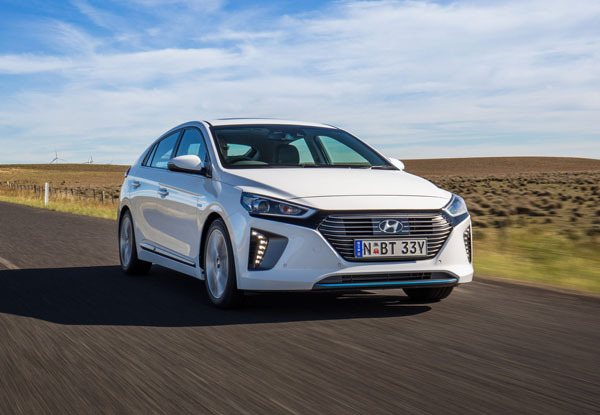 Cars like Hyundai Ioniq are typically sold to two different types of people: Those who are given them as a company car, with the company picking up the fuel bill; and private buyers with a strong interest in green motoring, indeed greenness in all aspects of their life. Official combined fuel consumption is 3.2 litres per 100 kilometres, at this stage fleet users are reporting about 4.0 litres per hundred kilometres. Derek Ogden’s driving falls into the former category, though he’s certainly no leadfoot. A quote from his review, “As for performance, in Eco mode the Ioniq, despite the driver’s giddy-up attempts, was reined in, producing a sluggish response off the mark and the need to choose overtaking options carefully. “Flicking the lever into Sport mode the Ioniq gained legs, scampering about the suburbs like a puppy let off the leash in a park. Paddle shifts add a further driving dimension for those who feel the computer has the car in the wrong gear. Though not in the extreme-greenie camp I do lean in the green-is-good direction, so my driving of the Ioniq was aimed at efficiency, but without going to extremes, certainly not to the extent of holding up other road users. Accelerating gently is the key to economical driving, enough movement of the pedal to get the car off the line in the first place and in particular away from traffic lights. Anticipating what is happening in front so you’re not taken by surprise that the traffic slows and then picks up speed again. On motorways you can keep consumption way down simply by cruising at the limit, or at whatever speed the traffic is flowing at. Hills are gentle on motorways thanks to excellent engineering but it still pays to gradually pickup speed on the downslopes and sacrifice it on the uphill bits. Again, though, don’t mess with the flow of other vehicles. Country driving offers steeper up and down stretches and often plenty of bends. Keeping the car flowing along is important, cornering at higher than average speeds if it’s safe to do so certainly trims fuel use. Just make sure you know how to do it. I averaged 4.0 litres per hundred kilometres to Derek’s 4.5 litres per hundred. A difference of virtually 10 per cent. Put another way that’s five weeks free petrol each year. Interestingly, my 4.0 litres was exactly the same as had been averaged by the official vehicle test fleet to date. Kia’s official fuel number for the Ioniq is just 3.2 litres per hundred kilometres. Frankly that sounds very optimistic. I didn’t go to extremes to cut consumption on the Hyundai Ioniq. Certainly not to the extent I did in the 1980s and ‘90s when being recorded in Guinness World Records for ‘Longest Fuel Range’. Would you believe 2724 kilometres on a single fuel fill? That involved a specially prepared Toyota diesel LandCruiser. It was within specs to keep it legal for the Guinness approved observer. The speedo was corrected for accuracy. The Cruiser was running on rock hard tyres on the flat plains of western NSW and central Queensland at as steady a speed as possible, I averaged 60 km/h. Driving meant straddling the centre of the road to avoid the tyres fighting against the camber and using the racing line on bends. Sounds silly? It’s not, because I was chasing every metre of distance and straightening the bends helped.